I do like a nice bowl. These were from Habitat. I wasn't even sure they still existed. Minty most things don't taste like mint. Funny isn't it? Same with strawberry, apple, banana and cherry. Even orange. When we see those flavours specified we accept that they will taste nothing like a strawberry, a banana, a cherry or a piece of mint. The original flavours exist only as some distant reference point. A bit like the association between Coke/Pepsi and the fizzy brown water stuff you get in fast food outlets. You need to have drunk actual Coke or Pepsi; to have that memory, not be be deeply offended by the barrel of watery guff you're now sucking up to lubricate the oesophageal journey of your horse burger. Not so much flavour as fiction. Mint fiction. A story once told. Well, it's time to get back to the origins. And so to mint ice cream. Much of it tastes like toothpaste. The colour is glow-in-the-dark GREEN. A hue so vivid it's never seen in nature, apart from perhaps the plumage of some Amazonian parrot. It's 'mint' in an industrial sense. MINT! I've made mint granita before but I wanted to see what real mint ice cream was like. There are several recipes, most seemingly following the great David Leibovitz's lead. Natural mint ice cream a very different experience; obviously far more subtle than the petrochemical variety but also more... not grassy, but... herbaceous. You can tell it was made from leaves. Making your own also means you can use a good quality chocolate. Here I used, as usual, Valrhona 70%. 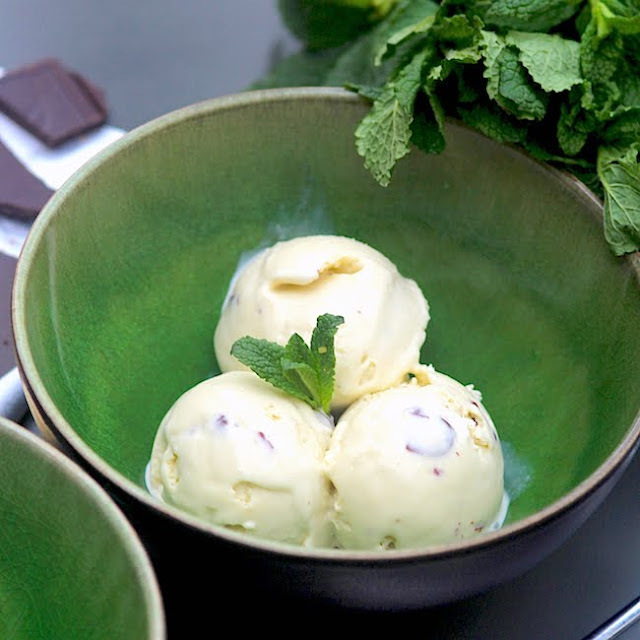 Fresh mint choc chip ice cream. Makes just over a litre. Summary: infuse milk with mint. Make a custard base. Churn that. Melt chocolate and drizzle into ice-cream to make the chips. No need to remove the stems. In a saucepan mix 500ml double cream, 250ml full fat milk and 130g caster sugar. Warm over a low heat. Take 75g of mint - that's three of the stupidly small supermarket packs or one big hearty hank from the corner shop - and bruise it by squeezing and twisting the leaves. This helps to release the mint oil. Submerge the mint in the milk mix and bring to the boil just briefly. Cover and leave to infuse for two hours. Any less and you're missing out on flavour, any longer and it doesn't seem to make a difference. I fancy it might allow in a slight bitterness too, but I'm not sure. At the end of two hours you'll have this: a vaguely green but very minty milk. Strain the milk using a sieve and use the back of a spoon or ladle to press out as much minty moisture as you can. Whisk in six egg yolks to the milk and stir over a low heat until it starts to thicken. This happens at about 77°C. Well, apparently it does but I often find I'm in the low 80s. I check using my food thermometer, this has the advantage of allowing me to heat the mix quickly until it approaches the low 70s, then I can pull back and stir constantly. If you heat too quickly you will of course have minty, creamy scrambled yolks. Try as I might, I can't think of a use for that. Don't expect a heavy custard, this is just thick enough to coat the back of a spoon. During one batch, the egg yolks I used were very orange which turned the gently green milk a rather unfortunate khaki colour. So I'd say try for pale yolks but how on earth can you tell? This custard base should now be chilled for a few hours before it can be churned for about 30 minutes in your ice cream maker. While your base is churning... take 200g (one bar) of decent, dark chocolate. You need the darkness to contrast with the cream and mint. Milk chocolate doesn't work as well. You have two options here. You can just chop it finely and stir in or you can go the Italian 'straciatella' route and melt the chocolate before pouring it in to the ice cream, thread like and allow the final few minutes of churn to break up the threads. The one advantage of this is you can add a little oil to the melted chocolate (something neutral tasting like groundnut or rice bran). This will lower the melting point of the chocolate so instead of ending up with a mouthful of chips, the chocolate will melt in your mouth with the ice cream. I've done it both ways. Both are delicious.